When planning a vacation, your chosen destination’s weather plays an important factor in what time of year you’ll visit! If you’re thinking about a getaway to the Shenandoah Valley in Virginia, you’ll be pleased to know that our region experiences pleasant weather for every season. Here’s what you can expect in terms of weather throughout the year and how to plan for the getaway you’ve been dreaming of. Also, don’t forget to download your FREE copy of our Shenandoah Valley Vacation Guide for a full list of local activities and attractions that you won’t want to skip. Get Your Free Shenandoah Valley Vacation Guide Now! The weather in and around Shenandoah Valley National Park varies greatly according to season and location. However, you can expect to enjoy decent weather and seasonal activities no matter what time of year you visit! If you’re trying to decide what time of year to stay with us at The Inn at Vaucluse Spring, here is a quick overlook at the Shenandoah National Park weather averages by season. Though the spring season does tend to arrive a bit late in our area, you can look forward to nice cool weather and the blooming of stunning wildflowers. You’ll usually begin to see the vibrant green foliage and sprouting of flowers around the beginning of April! This is also the perfect time to explore the park since crowds tend to be much thinner during this time of year. The summertime is one of the most popular times of year to be in the Shenandoah Valley, and it’s not difficult to understand why! The warm weather is ideal for hiking and the lush green trees provide plenty of shade for protection from the hot sun while in the valley. Since this is a big season for travelers, many local businesses, restaurants, and wineries re-open to accommodate the wide variety of guests. The Shenandoah Valley is known for its incredible fall foliage, so visiting during the autumn season is an absolute must! Beginning in September, you’ll notice the first signs of fall colors beginning to appear, perfectly accenting the vibrant colors of the wildflowers that have already sprouted throughout the park. However, the end of October is the best time to experience the area’s fall foliage. Be sure you bring a jacket since the weather tends to get a bit chilly, especially in higher elevations! The winter season certainly brings cold weather to the Shenandoah Valley, but it also brings activities you can’t enjoy during any other time of year. If you plan to get out and explore the park, beware of slippery ice and snow since frozen precipitation is common during this season. However, the clear skies and bare trees make viewing the area’s vistas and wildlife tracking a particularly rewarding experience. This is also a great time to get cozy in your accommodation at The Inn at Vaucluse Spring and enjoy room features such as the fireplaces and inviting common rooms. No matter what season you decide to visit the Shenandoah Valley, The Inn at Vaucluse Spring is ready to host you and your loved ones! Our beautiful and historic inn is perfectly situated beside its own private spring and just minutes from Wincheser, VA, Shenandoah Valley National Park. That way, you can enjoy a peaceful and tranquil setting without sacrificing convenience to your favorite local attractions. During your stay with us, you’ll be spoiled with warm hospitality, unique and beautifully decorated accommodations, and a delicious hot breakfast each morning of your stay. 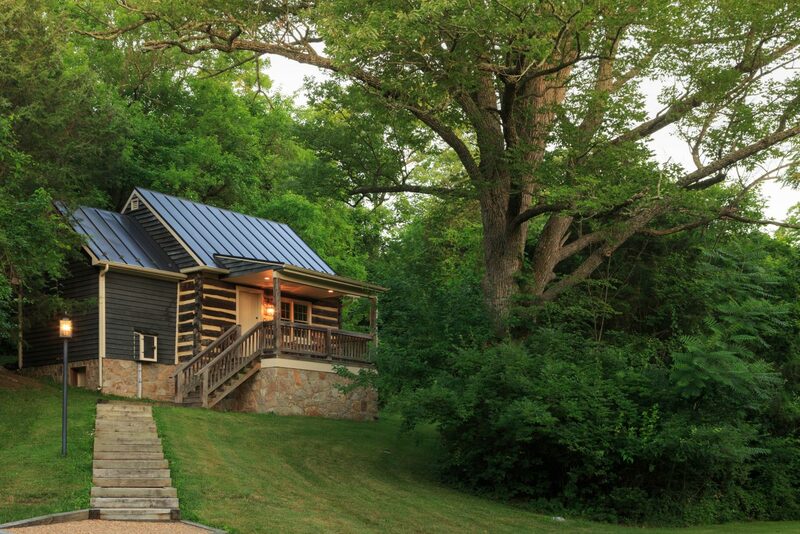 For a truly romantic and private escape, we highly recommend our Cabin by the Pond! This cozy cabin is tucked into the hillside overlooking the spring, offering mesmerizing views from your private front porch. Inside, you’ll enjoy features such as a warm fireplace, a king-sized custom made bed, exposed log walls, and a two-person Jacuzzi tub/shower combination. It’s the perfect getaway for you and your sweetheart! Check our availability and book your next stay with us today!